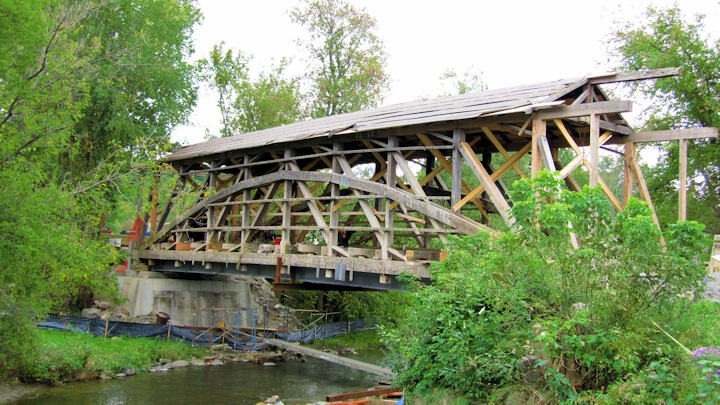 Charlotte, VT,September 23, 2013 - Work on the Quinlan (or Quinlan's) Covered Bridge is progressing, albeit behind the original schedule. The siding is still removed, fully exposing the trusses. Four steel beams now span between the abutments--an increase of two--in order to support greater live loads as required by the Town of Charlotte. It appears that much of the original fabric has been reused, but there are some evident replacements. 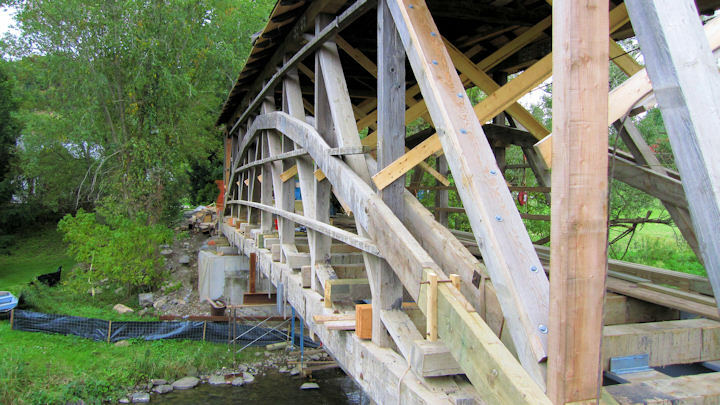 In particular, a handful of posts and diagonal braces are new, as are a few floor beams. The end members of the arches appear to be new. 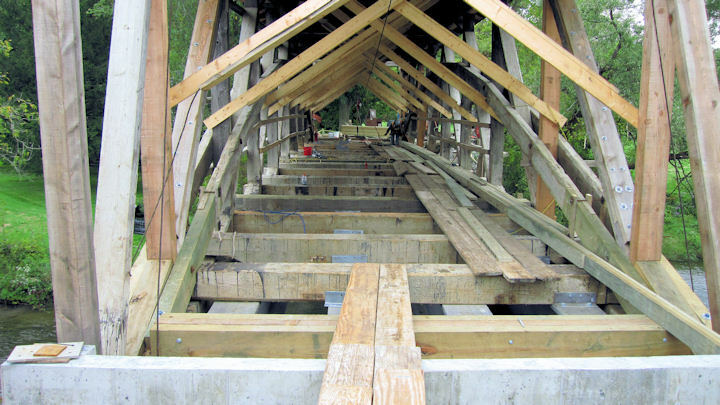 Since the bridge is off-limits, I couldn't inspect it fully, but one of the workers from Wright Construction said that the entire top chord on both trusses is new. It is evident that new lengths of timber have been scarfed into the bottom chords as well. The floor beams are spaced such that there is one at every post, and then one in between each post. 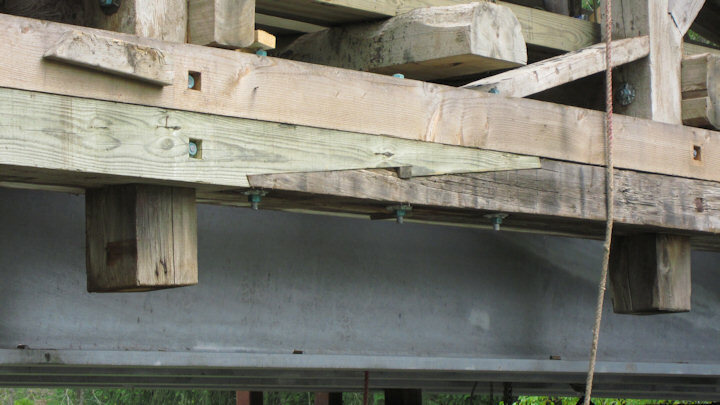 The floor beams in between posts have been notched on the underside such that they no longer rest on the bottom chord and are supported solely by the steel beams. 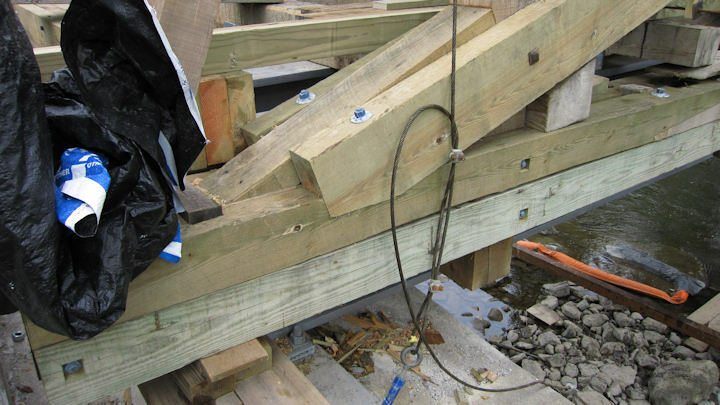 The floor beams at each post still rest on the truss chords, but are also resting on the steel beams. 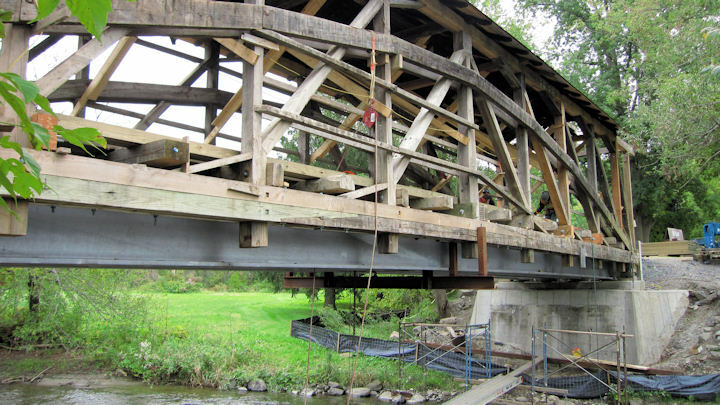 The contractor said in this configuration, the trusses will be supporting about 15% of the live load, with the steel beams shouldering the rest. On this day they were just starting to install the floor which is nail laminated 2x6's laid on edge. Temporary bracing is providing lateral support as all of the knee braces are currently removed. I didn't get an estimate of the completion date, as they were understandably busy, but installation of the floor has to be a pretty good sign that the end is getting closer. The siding is still removed, fully exposing the trusses. It appears that much of the original fabric has been reused, but there are some evident replacements. Temporary bracing is providing lateral support as all of the knee braces are currently removed. The end members of the arches appear to be new. The trusses will be supporting about 15% of the live load, with the steel beams shouldering the rest, said the contractor. Note the tension splice and the kick brace.